Both antennas are short for this band. 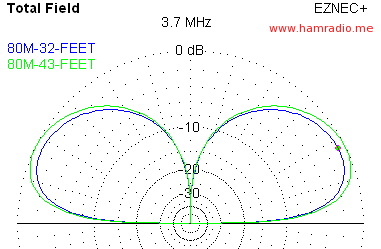 The 43 foot antenna uses an antenna matcher (tuner) somewhere in the transmission line to offset the non-resonant impedance; This is the case for all bands except, possibly, the 60 meter band where 43 feet is close to a quarter wave. The BigIR max height is about 32 feet or about an 1/8 wave antenna. The BigIR continues to not need an antenna matcher by adding an inductance in series with the 32 foot radiator. This inductance brings the antenna system into resonance with a resulting impedance of about 13 ohms. A 4:1 balun wound on an internal toroid transforms this to about 50 ohms… a slick system. I would call these results a wash. Both antennas work on 80 even though both are short for this band. It might seem surprising they are so similar despite the height difference. However, this pattern similarity reveals not all of an antenna’s length is actually used for radiating effectively. Indeed, the high current portion of the antenna does much of the work and in this case the lower portion of the antenna is this higher current area.